A new breed of intelligent electronic card has come into existence after experts¡¯ intensive research for half a year. HP Company added an encrypt counting chip to the No. 81 Dye Ink Cartridge of its HP 5XXX series spray-painting printer, so its cartridge is disposable and only dye inks produced by HP company can be employed. Therefore, there is no use for other compatible dye inks. The original prices for dye inks produced by HP Company are more than ten times dearer than dye inks of other brands. Our company developed this external-hanging style electronic card in order that users could have broader choices of better dye inks whose performances are as good and prices much cheaper. Basic Principle: a dye ink cartridge chip is installed in the electronic card and an anti-combustion circuit is employed to ensure the integrity of the chip in the dye ink cartridge. Meanwhile, a computer intelligent analytic chip is employed to render the values of the dye ink cartridge chip changeable to be compatible with HP 5000/HP5500, therefore, users can use the disposable dye ink cartridge. 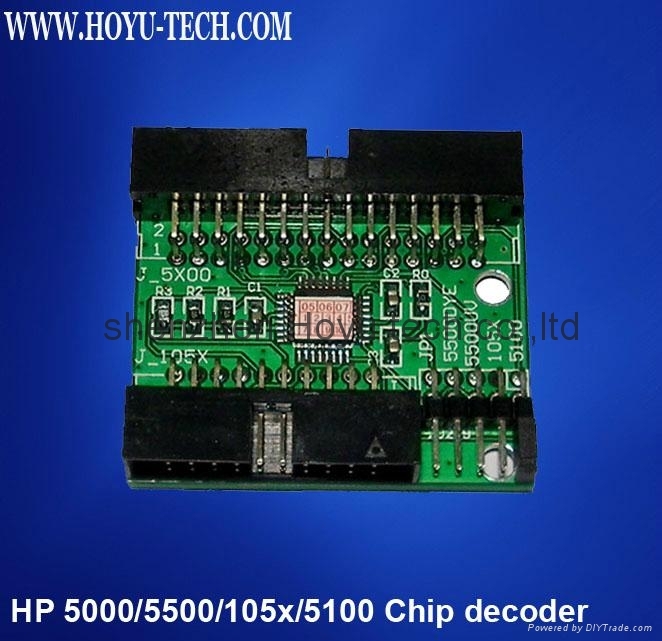 Since an integrated dye ink chip is employed, the dye ink capacity in the display panel of HP 5000/HP5500 will indicate the 100 percent state after the printer is started. Then, it will be reduced to about 25 percent, and then is will resume the 100 percent state. The cycle goes on and on. 1. Turn off the printer before you use it. Then open the cover in the back of the dye ink cartridge. Detach the printer¡¯s long data line from the seat of the dye ink cartridge. Connect it with the electronic card where there is a self-installed data line to be linked to the dye ink cartridge. 2. The inner packing of the intelligent electronic card can¡¯t be dismantled. The inbuilt program will get lost once it is opened and the card will become useless. Technological Consultations and a half-a-year guarantee period are provided for the intelligent encrypt card of our company. 1. The card can¡¯t be used together with other electronic cards. 2. The dye ink capacity in the display panel of the HP5000/HP5500 will indicate the 100 percent state when the printer is turned on after it was turned off. 3. In the case of program troubles (haven¡¯t occurred so far), all you need to do is to turn off the printer. The electronic card will resume to its original position. The dye ink capacity in the display panel of the HP5000/HP5500 will indicate the 100 percent state when the printer is restarted. 4. There should also be the dye ink cartridge (a disposable one will do) in the dye ink cartridge seat in the refitted HP5000/HP5500 Spray Drawing Printer that is a huge ink provider. If it is not refitted, users should pay attention to the dye ink capacity. When it is used up, without any indication the electric card will still be useful. 5. By disposable dye ink cartridge we mean the dye ink cartridge whose chip is burned or the chip counter reads Empty. It does not refer to any physical destructions or damages of the dye ink cartridge. 6. Do not make any choice when you see ¡°Replace ink cartridge Yes/No¡± in use. Turn off the printer directly and it will run well when you restart it.